The European Union spends more on advertising than the drinks giant Coca-Cola, according to a new analysis of how Brussels uses our money. Its budget for promoting itself and all its works comes to £2.4billion a year. That compares to the £2.13billion spent in the same year by the soft drinks company on promoting its brand around the world. The vast scale of the EU’s self-promotion was set down in a new ‘fiscal factbook’ designed to shed light on how Brussels spends the billions it receives from Britain and other member countries. Small-scale bills highlighted in the report include £160,000 paid towards a yet to open fitness and rehabilitation centre for dogs in Hungary. And on a larger scale the report details how the ambitions of EU diplomacy has seen 44 diplomats stationed in Barbados, one of Europe’s less-troubled trading partner nations. It also points to some of the widely-known but often forgotten aspects of EU spending condemned as driven by political folly. Among these is the annual budget of £150 million for ferrying MEPs and their staff between the European Parliament’s two headquarters buildings in Brussels and Strasbourg to appease politicians in Belgium and France. The EU Fiscal Factbook, published by the TaxPayers’ Alliance at the Tory conference, is likely to sharpen differences over Europe among the party’s MPs. 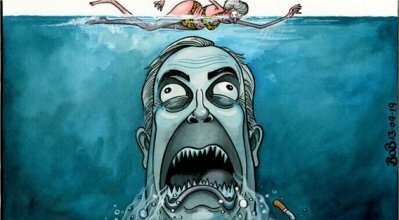 It comes at a time of deep anxiety over pressure from Ukip, which demands withdrawal from the EU. The TPA’s founder Matthew Elliott said: ‘Britain’s contribution to the EU gets bigger every year. ‘That means bigger tax bills for families and too much of the money is wasted. Brussels also makes life difficult for British businesses with draconian regulations. The dog fitness and rehabilitation centre in Hungary highlighted in the report, which includes the development of a hydrotherapy system, was given £160,000 in 2009 to ‘improve the lifestyle and living standards of dogs’. Progress has been slow and building work had not even started a year after budget approval. The money went to an IT company called Gyrotech that built new offices which remain empty. The Court of Auditors has refused to approve the EU budget for 18 successive years over concerns about mismanagement and fraud. But Herman Van Rompuy, President of the European Council, this month warned the auditors: ‘Your reports are not released into a void but into the rough and tumble of political life and media reporting. Every year, they generate headlines that “yet again the EU’s accounts have not been signed off”, with deceptive allegations of fraud and mismanagement. Since then the European Commission has told EU members states they should contribute an extra £3.5billion to Brussels this year to meet unexpected ‘legal obligations’. The bail-out will bring EU spending this year to £126billion, 8.4 per cent up on the previous year. Mr Elliott said yesterday: ‘Voters want clear facts as we move towards an EU referendum.’ The factbook sets out Britain’s net contribution to the EU – the amount paid after taking into account spending by Brussels in Britain – at £7,255billion euros in 2011. This is more than the contributions of France or Italy, and second only to Germany. Spain received more than three billion euros. Of overall spending, £44billion this year will go on the Common Agricultural Policy, the farm subsidy system often derided as the means by which France shores up its rural economy. The CAP paid handouts of more than £250,000 each to 889 British landowners in 2011. and more than £1million each to 47 landowners. The report calculated the burden of EU regulation on the British economy at £124billion, or £5,000 for every British household. The advertising budget included £15million on a Parliamentarium, opened in 2011 as a supposed tourist attraction, but described by critics as a ‘propaganda temple’. The cost of EU advertising was calculated in 2008 by the Open Europe think-tank, and includes a broadcast channel, an opinion polling organisation, films and huge numbers of publications, funding for sympathetic pressure groups, and special publicity conferences. Sink the EUSSR and ban their lousy flag. I'd like to buy the world a coke and teach them all to sing. @gerber wrote: I'd like to buy the world a coke and teach them all to sing. Hi Ho Hi Ho, It's off to trough we go EUSSR marching song.